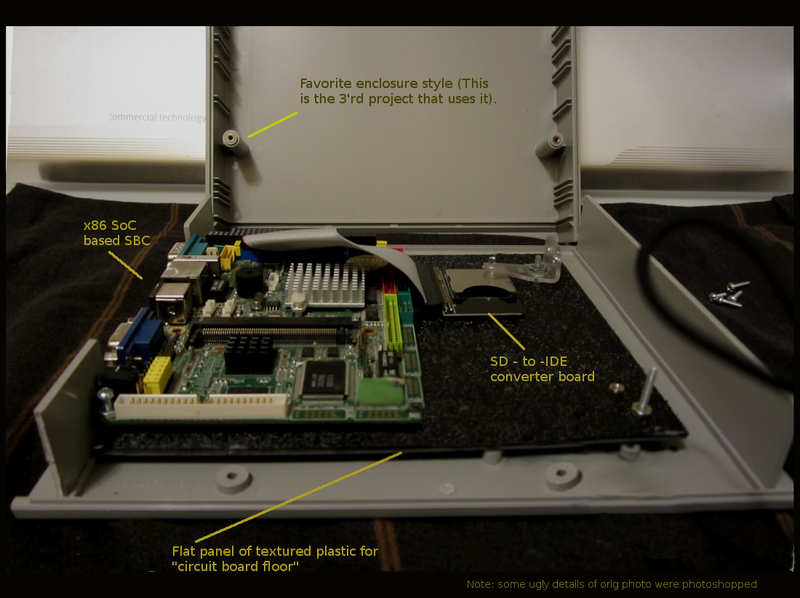 Figure 1: The Vortex86dx SoC SBC board is shown in the project box. Click to enlarge. My emphasis recently has been to convert the computing equipment at my establishment to use low power “off the grid” devices such as the ARM Odroid and Pi SBC boards. Yet, I have a small number of applications which have no open source equivalents, and so I need to have at least one “low power” off-the-grid x86 computer in the arsenal. The normal desktops that I’ve used in the past are simply too piggish on the power plug. The AMD/64 box swallows 95 watts, and would be a difficult customer for my battery banks. Along comes the Vortex86DX, with its two watt SoC. After the power sipping SoC is mounted on a board with peripherals, the total draw is still less than five watts. My battery banks can live with that level of power demand. I found some 24 inch flat panel plastic stock with a thickness of 3/16 of an inch on Amazon, and it seems to have the correct balance of strength and size. It’s thinner than the self-stick flooring tiles I had used in the XU4 SoC SBC project. It’s also a little easier to cut to size. The SD – to – IDE converter board allows the use of an SD (or, with adapter, a uSD) card, which the OS sees as an IDE drive. Using this device, I’ve found that the disk reads and writes are not very fast, but SD cards in general are not speedy things. The next thing I’ll try is a compact flash, since the particular SBC (as shown in figure 1) has a CF connector underneath it, which is exposed on the side of the enclosure box, via a large cut that I made for that and for other connectors. The SBC board is fanless, but the SoC chip does not seem to cause significant warming of the heat sink. I am not currently clocking this SoC chip to its 1 GHz recommended maximum, so it may run a bit more warmly if/when I do increase the clock speed. It runs so coolly at 800 MHz that I wonder if it could be overclocked a bit to enhance performance. That idea runs counter to what I should do in a solar charged battery environment though! Are there any noticed downsides with this board? Supposedly this SoC should have a clock speed of 800 or 1 GHz. Thus, it may not have the quipas for some operating systems. Supposedly it works with older version of Windows. We’ll see. My tests so far have put it to the task of running the Haiku operating system, which is another OS that (as of this writing) requires an x86 architecture machine. An ARM port is in-progress. Using Haiku, I can run the OS itself, the Vision IRC client, the image viewer, and some of the other apps. I’ve gotten a few “illegal instruction” errors – notably when using the default (Webpositive) browser on Haiku, and I think those errors may be due to an issue (according to some random wiki I visited) that concerns the i686 CMOV compatibility of the Vortex86DX, IIRC. Note that this is not something I know for certain. Since the CMOV instruction is an optional i686 instruction, I suppose this SoC can claim i686 compatibility. “Compatibility” or not, I think Linux GCC now expects the optional instruction when generating i686 code. According to that same random wiki this SoC will run all i586 code. Some operating systems seem to see the Vortex board as only an i486 (NetBSD, for instance). However; thus far this has not been a deal-breaker for me. FreeBSD/10.2-i386 runs fine on the board, with no noticed instruction issues, but x windows is pretty slow because (I think) recent Xorg versions require so much more memory than in the past – and memory is something which this board does not have in excess quantity. My board has only 256 MB, but can be upgraded (IIRC) – to 512 MB. The little device would still make an excellent (perhaps headless) access point (with hostapd) running on the FreeBSD 10.2 image. The board runs the Linux Wheezy/i368 installer with no trouble, but I seem to remember running into trouble when the new instance was booted for the first time. I need to retry that particular installation. The installer included with some recent versions of Ubuntu think this SoC is an i486, and subsequently refuse to continue the installation. It may be that some of the more recent Linux distros would be fine if recompiled for a different target (something less than i686). For running the few proprietary apps that I referred to in the opening paragraphs, I may still be looking for a solution. Time will tell. For now, the Haiku OS is doing the dance just fine for me on the Vortex. Maybe it’s the only OS I’ll need to use on this board. There are a number of boards produced with the Vortex86DX SoC. IIRC, the board I have sports 18 GPIO, 4 serial ports, one RS485, one RS422, three ethernet ports, a line-out port, a line-in port, two hardware watchdogs, 32 PWM channels, CF, IDE, three USB 2.0 ports, a parallel port, VGA, LVDS, JTAG, a floppy controller (yeah, that’s something), PS/2 keyboard and/or mouse connector, and a mini-PCI bus, to name a few things off the top of my head. Most of the IO is available via male 2x Dupont style connectors. Some IO uses standard connectors (like PS/2, EIDE, USB, VGA, and one RS232 serial port). This is from memory, so please excuse any inaccuracies in the info. About the enclosures: these project boxes are excellent, and have the correct compromise between costs, size, and usable interior space volume for my SBC projects. I’ve used three of them so far. They are available at the SimCo Box company for ~$3 a pop (almost a steal). Note that this author has no connection with them, but I surely like their products! Yet – this is not advice for others to follow! The boxes seem to work for me though. NetBSD is trademarked by the NetBSD Foundation, Inc, and the operating system can be found at http://www.netbsd.org. Haiku is a trademark of Haiku, Inc, and the project is located at https://www.haiku-os.org. This author and site has no affiliation with Haiku. “Raspberry Pi” is a trademark of the Raspberry Pi Foundation. This author and site is not affiliated with them. Odroid is a product of Hardkernel at hardkernel.com, and is not affiliated with this site or author. The Vortex86dx is a product of DMP at dmp.com.tw, and is not affiliated with this site in any way.